The RemoteMix One from JK Audio is a flexible communications interface in a rugged beltpack design for field reporters and live remote talent. 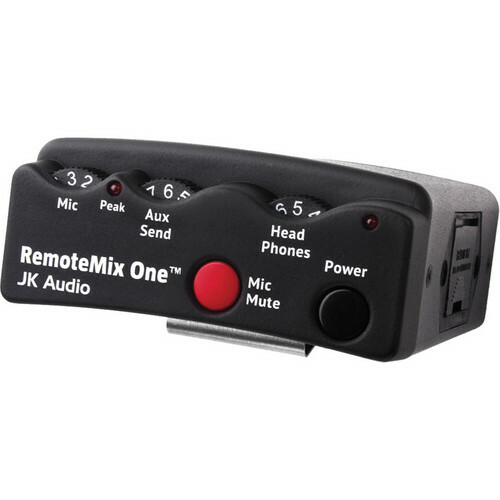 The unit allows for performing live, single-person interviews through a cell phone, and using the wired headset jack can provide two-way IFB connections through a cell phone or notebook for flexible remote monitoring. A professional microphone preamp and a headphone amplifier provide excellent sound quality and a 3.5 mm stereo line input jack allows the recordings to be mixed into a broadcast. The 3.5 mm stereo line output jack provides the full bandwidth microphone signal on the left channel, and the return audio on the right channel. The stereo headphone output provides a mix of the XLR microphone input, 3.5 mm input, and return audio. The 0.5 watt stereo headphone amplifier will cut through any crowd noise. The unit can be used as a headset replacement for normal voice calls, or to transmit full-bandwidth audio using third-party CODEC apps. Replaceable interface cables connect to most phones and notebooks. Box Dimensions (LxWxH) 6.7 x 5.4 x 2.4"